· A language is platform independent if it does not have any dependency on the operating system. Ø At the time of execution by using the O/S for launching the application. Ø It is compiled in a platform neutral manner. Ø Language provides its own runtime environment for the execution of its application. Ø Language provides a comprehensive library for the application developers to develop all types of application without using the O/S concern. Figure 1 is compiler-based program which directly calls O/S functions during execution. 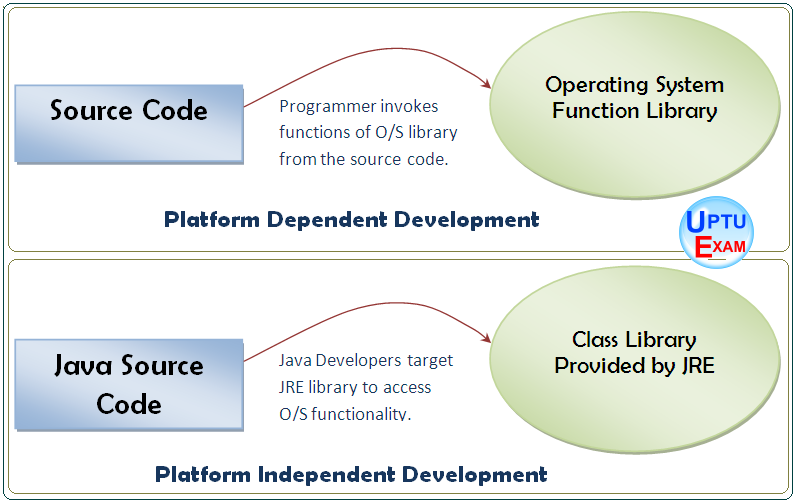 Figure 2 is interpreter-based program which is executed by JRE. Java application has no direct connectivity with O/S. JRE checks whether the application is violating any rules already mentioned in JRE or not. Thus it is a secured application than any other language’s application. SUN, IBM and Oracle did some Research & Development on JIT regarding performance tuning i.e. to increase the performance while interpreting the byte code. While the performance of interpreted bytecodes is usually more than adequate, there are situations where higher performance is required. The bytecodes can be translated on the fly (at run time) into machine code for the particular CPU the application is running on. 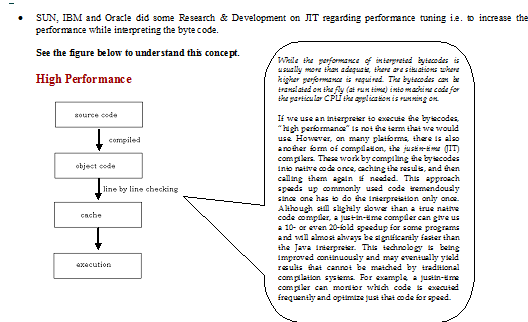 If we use an interpreter to execute the bytecodes, “high performance” is not the term that we would use. However, on many platforms, there is also another form of compilation, the justin-time (JIT) compilers. These work by compiling the bytecodes into native code once, caching the results, and then calling them again if needed. This approach speeds up commonly used code tremendously since one has to do the interpretation only once. Although still slightly slower than a true native code compiler, a just-in-time compiler can give us a 10- or even 20-fold speedup for some programs and will almost always be significantly faster than the Java interpreter. This technology is being improved continuously and may eventually yield results that cannot be matched by traditional compilation systems. For example, a justin-time compiler can monitor which code is executed frequently and optimize just that code for speed. See the figure below to understand this concept.